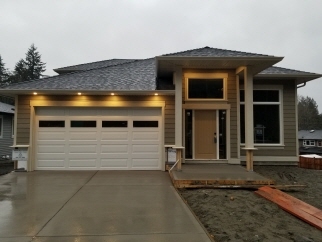 We are pleased to offer this quality built new 3 Bdrm/3 Ba front to back split home located in Holland Creek Estates. Approx. 1990 sqft of living space, the bright & airy open concept layout is comprised of 9 ft. ceilings throughout. The entry way leads into a living room boasting 12 ft. ceilings & gas fireplace on the main level. A few stairs down from the main level leads to the well-designed modern kitchen w large island featuring salad sink & quartz countertops, a spacious dining area open to the family room w a French door accessing the back deck. This level also offers a powder room & laundry room. Upstairs features a spacious master Bdrm with a 4-piece ensuite including a closet for storage. Down the hall offers a full Bath & 2 Bdrm's. Other features include gas furnace, on-demand hot water tank & built in vacuum system. Within close proximity to all manner of amenities Ladysmith has to offer. All information should be verified if fundamental to purchase.